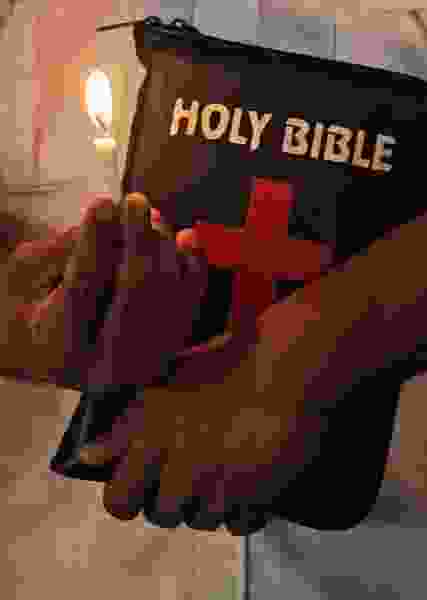 (AP Photo/Ajit Solanki) An Indian Christian holding a candle and a Bible prays at a church on Good Friday in Ahmadabad, India, Friday, April 6, 2012. Eugene Peterson died Monday. I wasn’t surprised at his death — Religion News Service reported last week that he had entered hospice care — but I was surprised by my reaction to it. I found myself grieving, and it was hard to concentrate on my work as I mourned this loss of a wise teacher. Peterson, probably more than any other writer, has taught me how to read the Bible — and still teaches me again because I keep making it more complex than it needs to be at the exact same time that I reduce it to something overly simplistic and undemanding. I tend to treat it as a rulebook, or a recipe book, while Peterson shows it to be nothing less than “the message” — the hidden word of God. So I pulled his books off the shelf and spent some time revisiting passages I’ve marked through the years as meaningful. Here are seven favorites. “Nothing and no one is a mere object, a thing that we can ignore or dispose of as we like. This is resurrection country. Resurrection is not something we add on to everything we are already accustomed to; it makes alive what has been ‘dead through … trespasses and sins’ (Eph. 2:1). It is understandable that we will still carry old cemetery habits and assumptions into this resurrection country. We have, after all, been living with them a long time (if you can call it living). And so we require a patient, long-suffering reorientation in the resurrection conditions that prevail in this country, living into the ‘full stature of Christ’ (4:13), our resurrection pioneer and companion. Paul begins our resurrection with the word ‘grace.’ It’s a word that he uses a lot.” — “Practice Resurrection,” 89-90. “What I want to insist on is that prayer is not something to be added on to the Christian life (or any life for that matter). It is the language in which that life is lived out, nurtured, developed, revealed, informed: the language in which it believes, loves, explores, seeks, and finds. There are no shortcuts and detours. Prayer is the cradle language among those who are ‘born anew’ and then the intimate, familiar, developing language of growing up to follow the way of Jesus. “But because in our secularized society prayer is often associated with what people of ‘spiritual’ interests pursue or with formal acts conducted by professional leaders, it is necessary from time to time to call attention to the fact that prayer is the street language that we use with Jesus, who walks the streets with us. We can’t put off prayer until we ‘get good at it.’ It is the only language available to us as we bring our unique and particular selves, ‘just as we are without one plea,’ into the daily, hourly speaking and listening to God who comes ‘just as he is’ in Jesus.” — “The Jesus Way,” 264-265. “Sabbath: Uncluttered time and space to distance ourselves from the frenzy of our own activities so we can see what God has been and is doing. If we do not regularly quit work for one day a week we take ourselves far too seriously. The moral sweat pouring off our brows blinds us to the primal action of God in and around us. “Sabbath-keeping: Quitting the internal noise so we hear the still small voice of our Lord. Removing the distractions of pride so we discern the presence of Christ ‘… in ten thousand places, / Lovely in limbs, and lovely in eyes not his / To the Father through the features of men’s faces.’” — “Working the Angles,” 72-73. “And so, as we hand out Bibles and urge people to read them, it is imperative that we also say, caveat lector, let the reader beware.” — “Eat This Book,” 81-82. “We do not progress in the Christian life by becoming more competent, more knowledgeable, more virtuous, or more energetic. We do not advance in the Christian life by acquiring expertise. Each day, and many times a day, we return to Square One: God Said. … We adore and we listen.” — “Subversive Spirituality,” 30. “Pastor John of Patmos showed me the way. He wrote what he saw. His Revelation is the result. … What I have come to see and to recognize is that if I had to put in a single sentence what I have learned from John regarding the way he wrote what he saw, it is this: godtalk — depersonalized, nonrelational, unlistening language — kills. In the land of the living it is blasphemous, whether spoken from pulpits or across the breakfast table. ” … And here is something that never ceases to astonish me. Pastor John of Patmos knew his Bible inside and out. The Revelation has 404 verses. In those 404 verses, there are 518 references to earlier scripture. But there is not a single quote; all the references are allusions. Here was a pastor and writer who was absolutely immersed in scripture and submitted himself to it. He did not merely repeat, regurgitate, proof-text. As he wrote, the scriptures were re-created in him. He assimilated scripture. Lived scripture. And then he wrote what he had lived.” — “The Pastor,” 243-244. “The Christian life is not a straight run on a track laid out by a vision statement formulated by a committee. Life meanders much of the time. Unspiritual interruptions, unanticipated people, uncongenial events cannot be pushed aside in our determination to reach the goal unimpeded, undistracted. “Goal-setting,” in the context and on the terms intended by a leadership-obsessed and management-programmed business mentality that infiltrates the church far too frequently, is bad spirituality. Too much gets left out. Too many people get brushed aside. “Maturity cannot be hurried, programmed, or tinkered with. There are no steroids available for growing up in Christ more quickly. Impatient shortcuts land us in the dead ends of immaturity.” — “Practice Resurrection,” 133.